Its fresh from RIM and should be headed your way shortly. Last edited by John Clark : 08-21-2008 at 01:07 AM. Last edited by John Clark : 08-21-2008 at 09:46 AM. Thanks for the assist, John Clark! Last edited by mattguyver : 08-21-2008 at 02:32 AM. i wonder where can i find it . Are you saying this is in the wild?? out for the 8130 and 8330, as well. So for you guys who now have it...has it helped the memory leak issue any? I'm still on 4.5.0.51 but will be searching for .77 tonight when I get home from work!!! Moi aussi! Thanks for the heads up, first poster. I'm loving .51 but, now that I know what's involved in doing the upgrade, I'm ready to move to the next level. breakerfall, you owe JC an apology. A public apology. Since YOU took it public to begin with with your accusation, then somehow expected a quiet, private reply to spare you from embarassment, after publicly accusing JC in the first place. I really thought that was JC with the funny face's with his finger up his nose. Um, the screenshot above already proves it exists. screenshot can be doctored. someone did it on crackberry. The above screenshot doesn't look doctored to me. 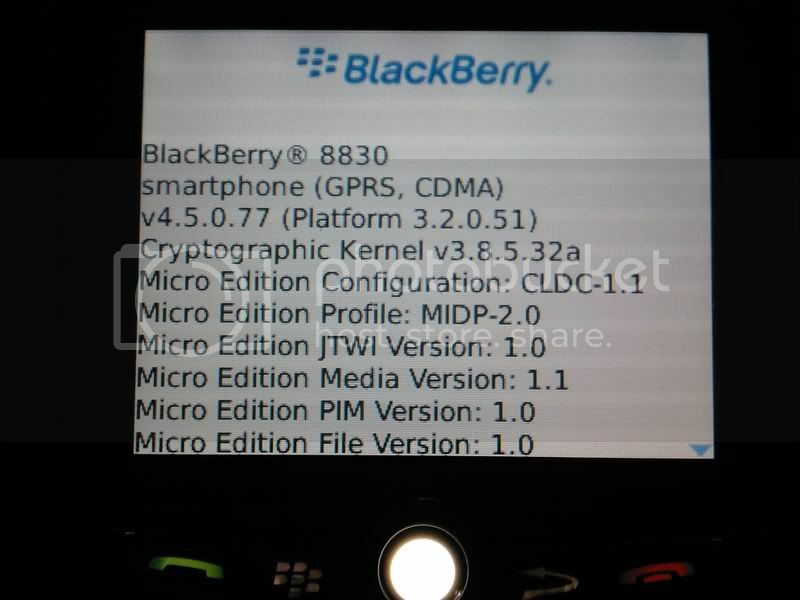 Additionally, I know that it's being tested by RIM so I'm not surprised to see it start showing up out in the wild. there thats the one i wanted to show, its pretty flawless doctoring. You can tell it's been doctored by the pixelation in the red. It's been edited and resaved in a PS like program and the colorcount has therefore changed.